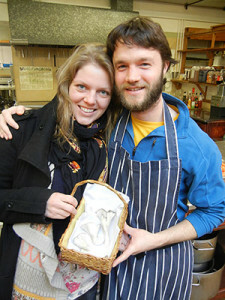 Astrid and I with our very first cultivated oyster mushrooms. Located on Washington states’ Key Peninsula, Adam’s Mushrooms grows and forages top quality specialty mushrooms and seasonally harvested wild foods. Since starting in 2013, our efforts have evolved to meet the needs and interests of chefs, produce managers, and farmers’ market regulars. We’ve learned a lot, and continue to follow our passion for the fungi and our local forests. You can find our produce at select area farmers’ markets, restaurants and grocery stores, and purchase our dried mushrooms from this website. Please check out our facebook page for more of what’s in season and where you can find us!